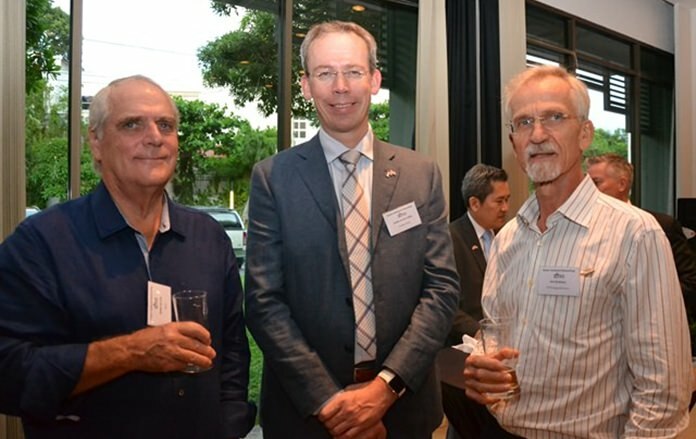 The Netherlands Thai Chamber were the host for the monthly combined chambers of commerce networking held at the Rim Suan meeting room at the Amari Garden Pattaya on Friday the 27th of May. 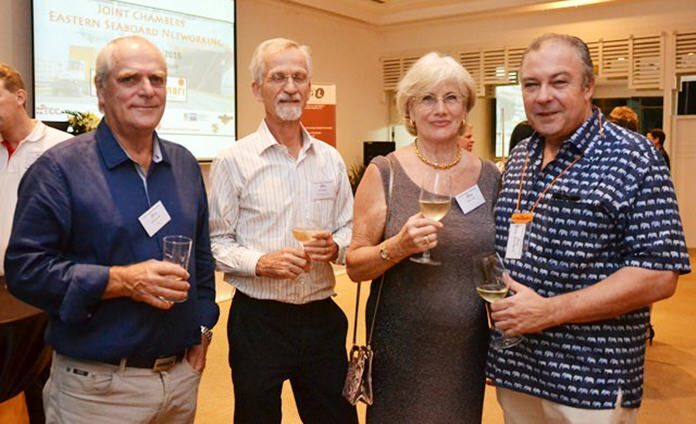 The combined chambers brings together members from the British, American, Australian, Belgium, Canadian, German, South African and of course the Netherlands Thai Chamber. Porametee Vimolsiri, Ph.D., Secretary – General of National Economic and Social Development Board gave an informative talk about development plans for the future of the Eastern Seaboard. A brief introduction was given by the executive director of the Netherlands Thai Chamber, Hans van den Born, who stated with a wry smile that as they are Dutch, they try to do things a bit differently, hence instead of just the normal networking he stated that two guest speakers would be making a short presentation. First up was Porametee Vimolsiri, Ph.D., the Secretary General of National Economic and Social Development Board, who gave an informative talk about development plans for the future of the Eastern Seaboard. These included expansion at Laem Chabang Port with the Singe Rail Transport Operator, a 2,944 million baht project to help reduce time and logistics. It is scheduled to be completed by 2017. 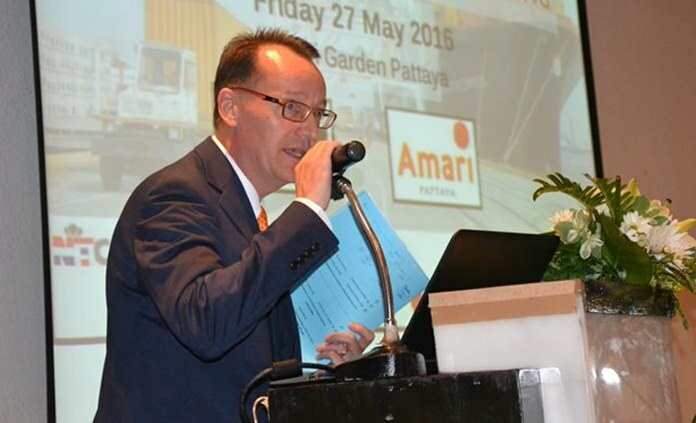 Hans van den Born, Executive Director of Netherlands – Thai Chamber of Commerce (NTCC). Also a new 106 km dual rail track from Khengkoi to Chachoengsao, which will cost approximately 11.348 billion baht and be completed by February 2019. 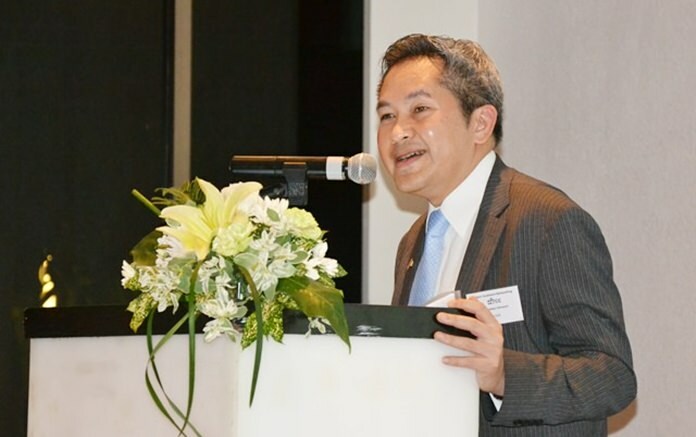 Porametee said expansion work being carried out at U-Tapao Airport includes a new terminal able to handle 3 million passengers a year, a new apron, and new ground service and cargo facilities. He also gave details of the new highway which will link Highway 7 with the Maptaphut Industrial Estate. These plans are well underway and also include upgrades to the electricity network and telecommunications. 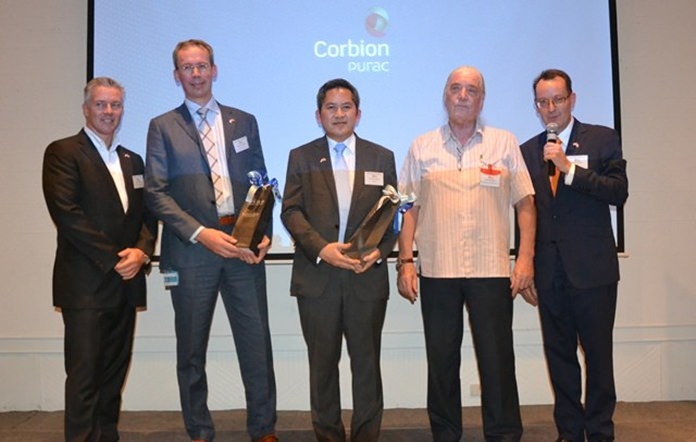 Sander Van der Linden, Plant Director for Corbion Purac Thailand. Looking further ahead to 2021, there are plans for a 193km high speed rail link from Bangkok to Rayong at a cost of 152.712 billion baht. 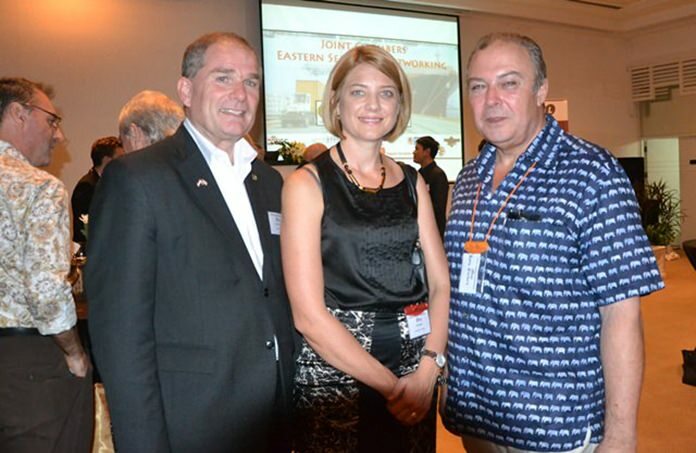 Porametee Vimolsiri was very well received and showed great confidence in the Eastern Seaboard as a hub for business. He was followed by Sander Van der Linden, Plant Director for Corbion Purac Thailand, the number 2 investor in the Eastern Seaboard in 2016. They provide biobased ingredients for food and biochemicals. (L to R) Stefan Van Der Sluys, President /CEO of Best Global Logistics Co., Ltd., Sander Van der Linden, Plant Director Corbion Purac Thailand, Porametee Vimolsiri, PH.D. Secretary – General of National Economic and Social Development Board, Helmut Buchberger, ABC Asian Business Consulting, and Hans Van Den Born, Executive Director of Netherlands – Thai Chamber of Commerce (NTCC). 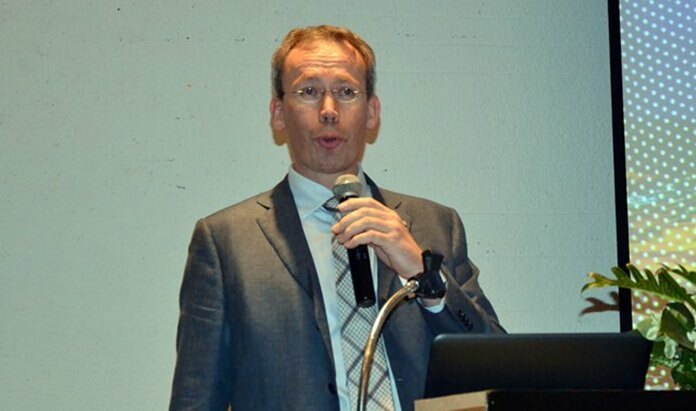 Van der Linden informed the guests that Corbion is the global market leader in lactic acid, lactic acid derivatives and lactides, and a leading company in functional blends containing enzymes, emulsifiers, minerals and vitamins. 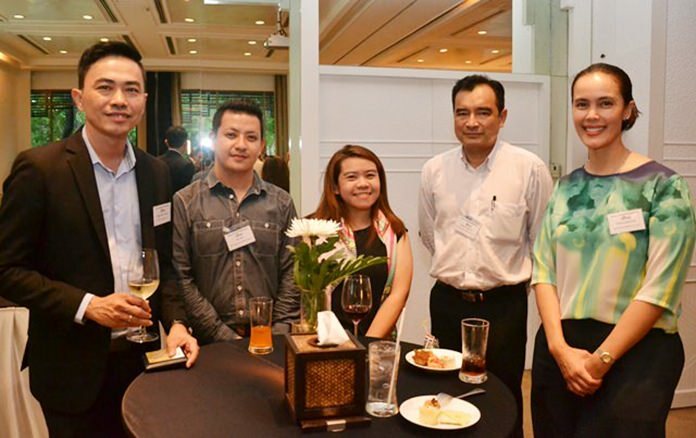 In 2013, Corbion had a workforce of 1,885 employees, of which 210 were in Thailand. The networking was sponsored by Best Global Logistics who offer customized, industry-specific supply chain solutions. 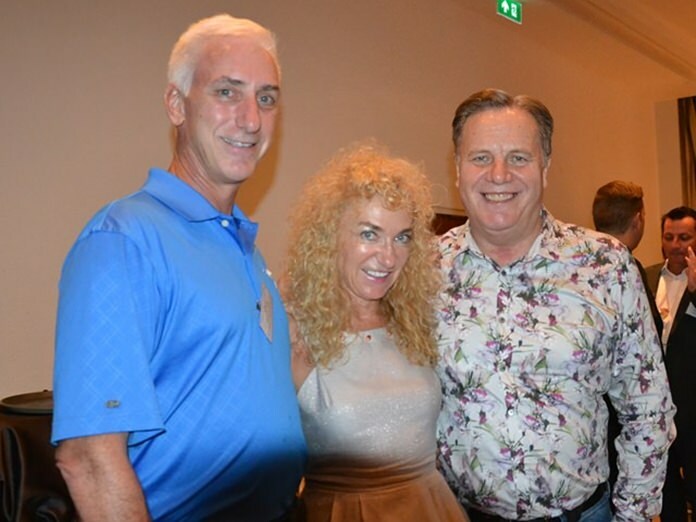 (L to R) Jeffrey Gaudiano, Managing Director of BMW Group Manufacturing Thailand, Irene Schuermann, and Simon Matthews from Manpower. The staff at the Amari were constantly doing the rounds topping up beer and wine glasses and serving delicious snacks. Many familiar faces from the business and hospitality sector were present including Amari Pattaya General Manager Robert Rijnders, Holiday Inn GM Kate Gerits, and the ever convivial Rene Pisters from the Thai Garden Resort, along with Jeffrey Gaudiano, Managing Director of BMW Group Manufacturing Thailand. (L to R) Robert Rijnders, Amari Pattaya’s GM., Kate Gerits, Holiday Inn Pattaya’s General Manager, and Rene Pisters, GM of Thai Garden Resort and Hotel Pattaya. Representing the South African Chamber was Graham MacDonald, and on behalf of the British contingent, Greg Watkins, Simon Matthews and Mark Bowling. 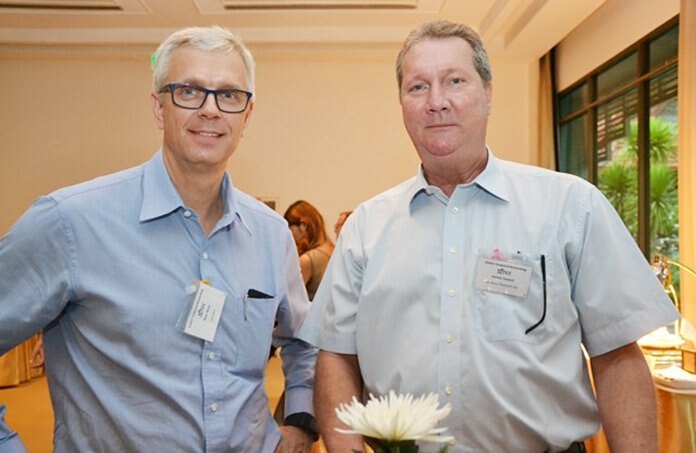 Karsten Deckert from Leschaco (Thailand) Ltd. and Peter Weiss from Suretank. (L to R) Reiner Seel, German Audit and Tax Practice, Tom Thomos, Chief Executive officer of Pacific Cross Health Insurance PCL., David Bell, Managing Director of Crestcom Trainers to the world Ra-Kahng Associates Limited, and Noonoi. 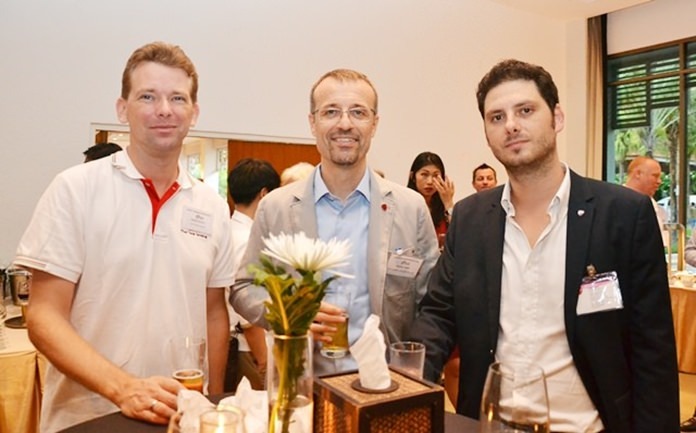 (L to R) Martin Schouten, from Thai Tank Terminal, Gabriele Piaggio, Ducati Motor (Thailand) Co., Ltd., and Luca Martin, Asian Suppliers Development Director. (L to R) Sukhumnanda Sukudom, Adun Pasu, Jantana Chatchawarn, Noppadol Suleelaporn and Thitima Lamphaibool. (L to R) Willem De Vries from NTCC, Sander Van Der Linden, and Hans Bodewes. 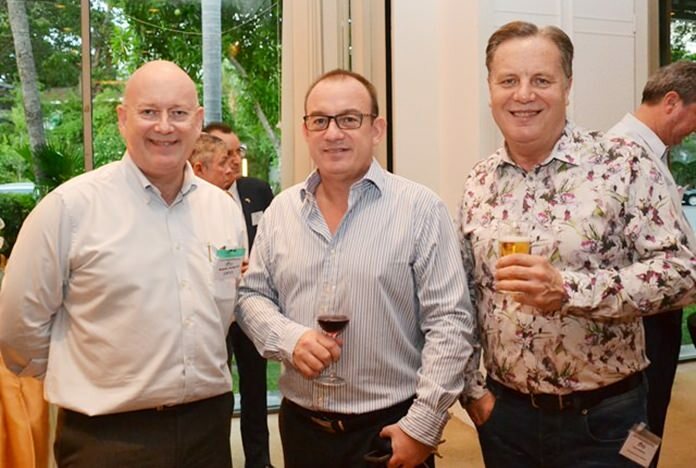 (L to R) Graham Macdonald, president of the SATCC, Mark Bowling, Associate Director, Head of Eastern Seaboard at Savills (Thailand) Limited, and Simon Matthews from Manpower. 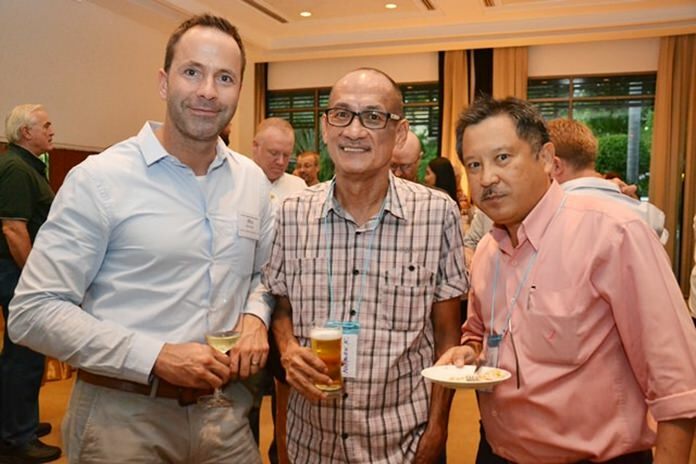 (L to R) Marc Watzal, Umicor Autocat (Thailand) Co., Ltd., Nopporn K. and Dr. Ing Benjamin Pornimit. 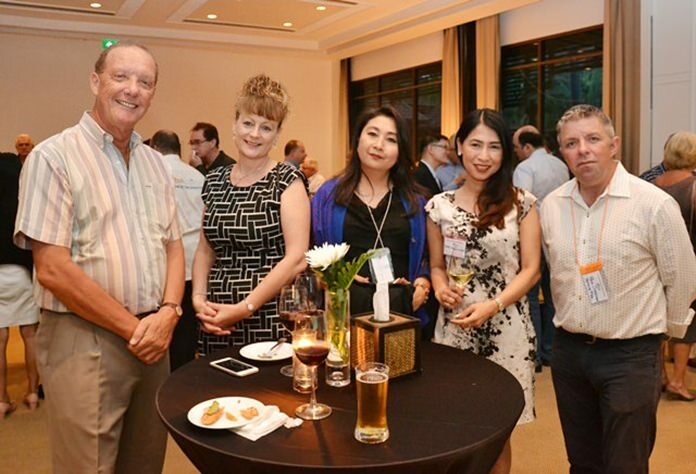 (L to R) Stuart McKenzie, Angie Turton, Dive in Pattaya, Chada Puranapin, June Hongsuwan, Senior Vice President, Zhongtai International Wealth Management, and Paul Strachan from Pattaya Mail. 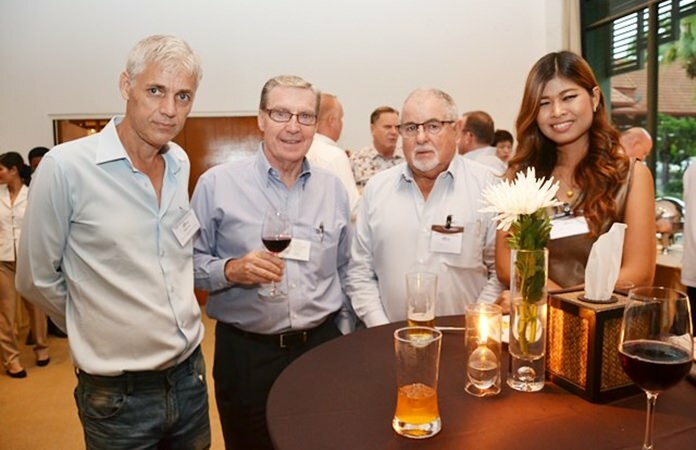 (L to R) Willem De Vries, NTCC, Hans Bodewes, PTT Energy Solutions, Denie De Vries, and Rene Pisters, GM of Thai Garden Resort Pattaya.